A new floral tile with Japanese form peony and hydrangea flowers. I decided to experiment a bit with brighter colours, but still I was very sceptical at the beginning about these vivid orange shades. They are completely out of my comfort zone and I went back and forth whether to use them or not. I didn’t want the orange hydrangea flowers to be the focal point of this artwork. The solution was to tone them down a little bit by pairing them with muted colours, hence my choice for the white peony and the grey leaves. To make sure the finished piece will be in the shape of a square, I like to use a little cardboard box and arrange the leaves and flowers inside it. I usually start by positioning the larger element first – in this case the Japanese peony – and then I just work around it trying to fill up all the empty spaces. Once I am happy with the outcome, I transfer all the pieces on a square cardboard which I will mount in a deep shadowbox frame. The size of the floral tile is 12cm x 12cm (approximately 4 3/4” x 4 3/4”) and the frame measures 25cm x 25cm (approximately 9 7/8 ” x 9 7/8″). 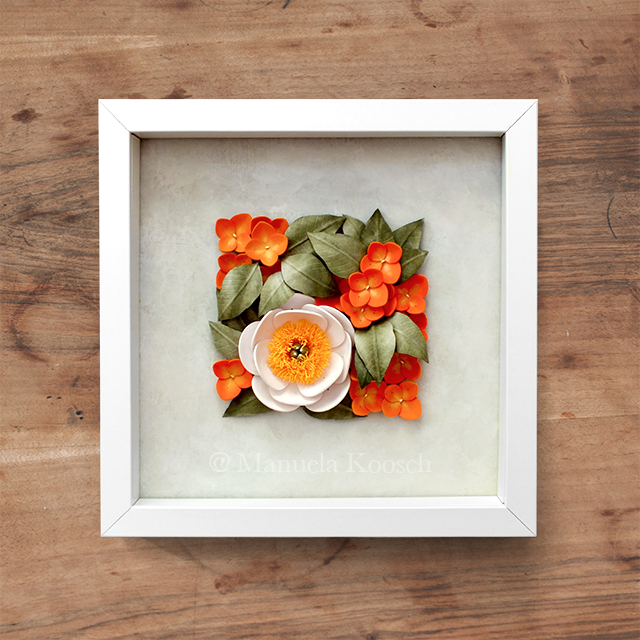 This floral tile, among a few other pieces, is available in my Etsy shop. If you would like to give it a new home, I offer worldwide free shipping. It comes in a white shadowbox frame enclosed by a sheet of organic glass for protection against dust.